Following a historic diagnostic procedure last month, Brookfield Zoo’s 2,300-pound eastern black rhinoceros, Layla, underwent life-saving surgery last week to relieve an infection that had been obstructing her nasal passageway. 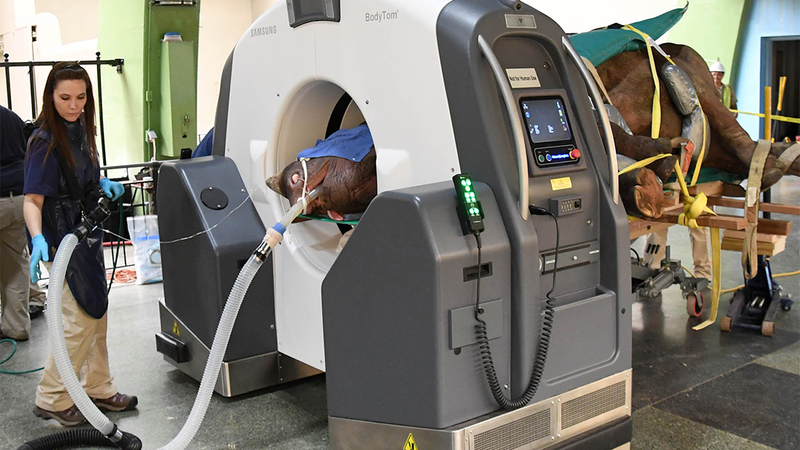 The zoo’s veterinarians identified the bacterial infection April 19 during what is thought to be the first CT scan ever performed on a rhinoceros. Moving Layla to and from the portable scanner required a front-end loader, a custom-made wooden platform and nearly 40 staff members, who conducted several practice runs using 2,300 pounds of concrete to simulate the animal’s weight. High-powered images of Layla’s skull revealed abnormal tissue in the root of one of her upper molars, which veterinary staff determined had been causing the obstruction of Layla’s nasal passages and sinuses, making it difficult for her to breathe. Because rhinos are mostly unable to breathe through their mouths, any amount of nasal obstruction can become dangerous, according to the zoo. On May 7, veterinarians performed surgery to partially relieve the infection, which improved Layla’s breathing. On Tuesday, the 7.5-year-old rhino received a second CT scan to identify the extent of the remaining infection in her nasal passageway. Immediately after the scan, veterinarians performed another surgery to further relieve the infection. The procedure was Layla’s third operation this year. She first underwent surgery in late January after staff initially noticed that she was having trouble breathing. To treat Layla’s infection, CZS veterinarians have been working with Dr. Chris Downs, a veterinary surgeon from the Chicago Equine Medical Center. Two veterinary specialists from North Carolina State University and a veterinary dentist from the University of Georgia have also provided expertise, the zoo said. Layla was born in 2010 at Kansas City Zoo and arrived at Brookfield Zoo in 2012 on a breeding recommendation as part of a collaborative Species Survival Plan. She is one of just 59 eastern black rhinoceroses in North American zoos. The species is considered critically endangered, with an estimated 5,000-5,400 individuals living in the wild, mainly in East Africa.